All of us writers probably have experienced a writers block once or twice. Or maybe even a lot of times, but we all know, a writers block isn’t the nicest thing to have. Minutes, hours, days or even weeks or months you can’t even think of a good thing to write. Staring at your computer, doing laundry, redecorating your house, everything seems more interesting then writing your next article, book or even a blog. Many famous musicians and all kinds of writers have experienced a writers block in the past. And in this digital century, not only writers of books, music and long articles experience this phenomenon, but every online writer can get overwhelmed by the information flow on the internet. You probably can’t use a situation like this and that’s why we’re going to help you to get out of your writers block as quickly as possible! How does a writers block occur? And maybe even a better question, how long does it last? Writing is a creative process and like every other creative process, you can’t always predict how this process evolves. This process depends on many different factors that you can’t control. And if these factors evolve in the wrong direction, you’ll get a writers block. A (temporary) loss of inspiration. You can get a writers block at all times in your writing process and the most common one definitely is: “What to write about?”. These writers block’s mostly take a few hours or days, but if you’re really unlucky they can take months or even years. And that’s something that we want to prevent. Luckily for us writers, there are a few techniques that work very well when you’re fighting a writers block! What to do about a writers block? There are many different ways to block your writers block and there are also a lot of things that you shouldn’t do. 1. Don’t try too hard! 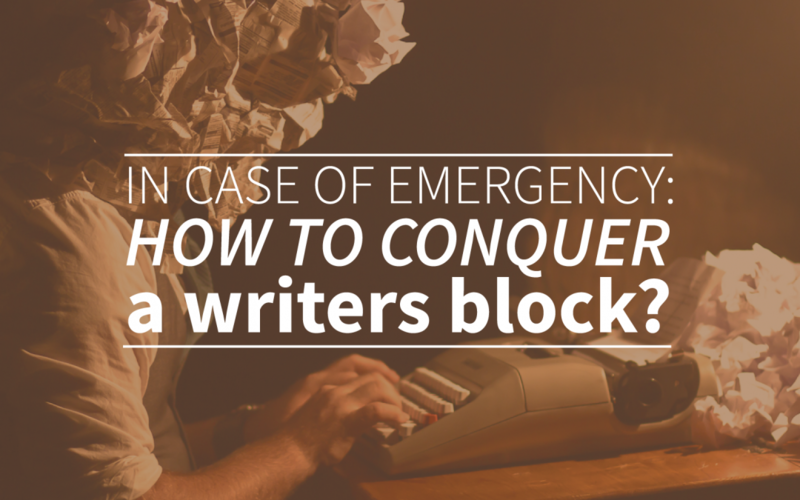 You can finish reading this article, but don’t be too obsessive with your writers block. Reading numerous articles about how to get over your writers block probably won’t help you. The best thing to do is to take your time for something else, something that you really enjoy. The best way to block your writers block is to stop thinking about it too much. 2. Change your working environment! Do you remember the times when you spent day after day in that musty classroom and your motivation floated away? That might be exactly what’s happening to you right now. If you want to blow some fresh air into your writing, you should change your environment. Go write outside, on the rooftop, in your favorite cafe or anywhere else. Every place that inspires you can get you out of your writers block. 3. Change your writing habits! Almost every writers has his own writing habits. You might not even think about it anymore, but if you’re stuck, this might be the way to get out of your writers block. For example, maybe you always write on your laptop, you always read your sentences twice before continuing or you always start at eight and finish at three. Find these habits and change them. Changing your habits is the perfect way to get out of your writers block, because habits are often the killers of your new ideas. 4. Let your creativity flow the other way! Writing isn’t the only form of art that lets your creativity flow. And especially when your writing inspiration doesn’t come by it’s self, you should try to get it back another way. Start painting, singing, playing an instrument, dancing or make a movie. The possibilities are endless! It relaxes you and at the same time your creativity will evolve in a whole new way. 5. But while you try all the tips above, don’t stop writing! It might seem hard, but eventually your writers block will disappear. You shouldn’t give up your passion if times are bad! You know better than that! Hopefully we helped you out of your writers block, if not, just keep on writing! We and a lot of other people love to read your writing, so we’ll wait for you! Don’t forget to make a free trial of webtexttool to optimize and store your writings easily online!